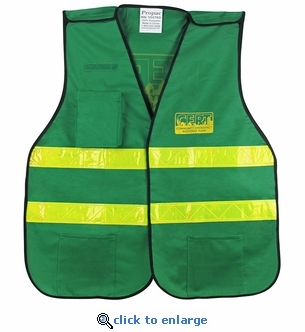 This CERT green ANSI II safety vest with reflective stripes on the front and back will identify CERT members while on scene during an emergency response situation. This one-size-fits-most safety vest features two lower pockets plus a radio pocket and Velcro strip on chest area for other attachments. Material: Lightweight, high performance polyester. C.E.R.T. logos imprinted on front and back. 2" reflective stripes for high visibility. 5-point-breakaway design for added safety. Size: One size only - fits most people.